** CONVERTIBLE RACING MODE** 1 OWNER ** SUPER CLEAN ** NON-SMOKER ** FULLY SERVICED ** NAVIGATION ** AUTO LEVELING HEADLIGHTS** RAIN SENSING WIPERS** HID HEADLIGHTS** HEATED MIRRORS** LEATHER** DAYTIME RUNNING HEADLIGHTS** ROLLOVER PROTECTION BARS** SATELLITE RADIO** BLUETOOTH TECHNOLOGY, PREMIUM STEREO, BT AUDIO, STEERING WHEEL CONTROLS, HDD CONNECTION, AUX INPUT, ... EXTRA CLEAN!! ** LOWEST FINANCING RATES ** ALL CREDIT WELCOMED TO APPLY ** $0 DOWN LOANS AVAILABLE ** High Approval Rates...APPLY ONLINE at WWW.UIAUTOS.COM ....FOR BEST BUYING EXPERIENCE, CALL NOW at 770-881-8008.OPEN 7 DAYS...MON - SAT 10.00AM-7.00PM ... SUNDAYS BY APPOINTMENT 1-5.. TRADES WELCOMED... WE SHIP EVERYWHERE... ATLANTA AIRPORT PICKUP AVAILABLE... LOCATED at 442 S ATLANTA ST, ROSWELL GA 30075...COMPREHENSIVE EXTENDED WARRANTIES AVAILABLE ON DEMAND. 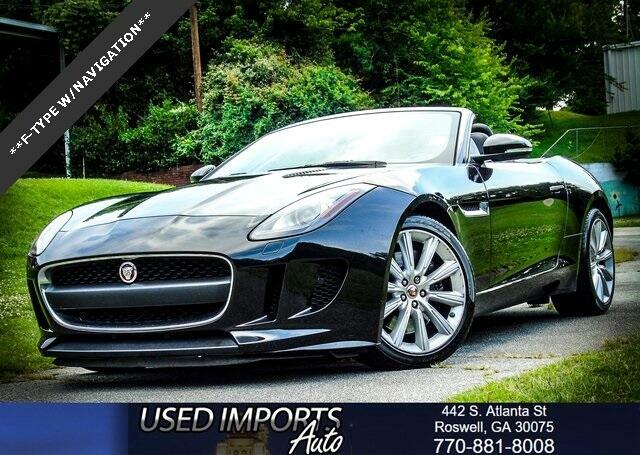 Message: Thought you might be interested in this 2015 Jaguar F-Type.